Metro light rail car 144 will make its last run on July 25 before retirement. Afterwards, it will be trucked to its new home at the Orange Empire Railway Museum in Perris. Car 144 was one of 54 identical “P865” type cars to open service on the Los Angeles-to- Long Beach Blue Line on July 14, 1990 — a date that marks the return of rail to Los Angeles County after a 27-year absence. Since then, 144 has been a regular fixture of the Blue and Expo lines for 28 years and logged more than 1.8 million miles of service. The last of the P865 class will be retired from service in August of this year, while 15 identical “P2020” class cars will continue to run for an additional five to six years. Upon arrival at the Orange Empire Railway Museum, 144 will be preserved and operated for visitors on the museum’s demonstration railway. It will be in good company, taking its place among dozens of preserved historic Los Angeles trolleys and interurban trains which have been delighting visitors at the museum since it was founded in 1958. The museum is the only place in the world where you can actually take a ride in a restored “Red Car” or “Yellow Car” from Los Angeles’ transit past. Pacific Electric “Red Car” trolley at the museum. So if you’re a fan of the old P865s and are a little bummed about their retirement, never fear! You’ll soon be able to visit car 144 at the Orange Empire Railway Museum. You have the title wrong. It is car 144, not 114. How much would a P865 cost. What is it’s scrap value at the end of its life? There were 4 up for auction on http://www.proxibid.com a few weeks ago. The bid reached a high of $3500 but that was below the reserve price and did not sell. I believe that they were purchased as movie props at $8800. In any event, they were scrapped several weeks ago. But the nearly identical P2020s should be up for sale in about 5 years. Hey there Gary! It’s been SO long since we’ve seen you. Love seeing you commenting here. I’m not sure but San Diego donated their retired train cars to a city in South America. I’m sure with a refurbishing they could go on for another 10 plus years. You have 144 shown in the photo, But list 114 in the title. The car going to OERM for preservation is the 144. Hopefully it will be painted in the original Red and Orange colors of the Pacific Electric Railway like two Blue Line cars once sported for a brief time! These cars looked really good linked up in threes. The new trains are fine, but can Metro please change the next stop digital screens. They look like a cheap atari game and are confusing. Hard to believe that the Blue Line has now been in service longer than the gap of no light rail in Los Angeles County. 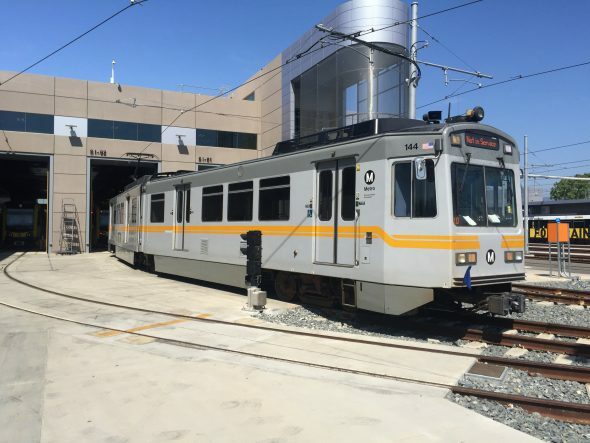 So, there’s a chance that the 1994-95 Nippon Sharyo P2020 railcars will get a chance to appear in Azusa and East L.A., when the Blue and Gold lines get linked as 2 light rail lines, once the Regional Corridor gets completed in the future? I hope Empire gets more funding. I visited a few years back and they had a lot of cars in the works with plans to lay track to the peris metrolink. not sure if that happened. Anna Chen, thanks so much for this article. Can you please confirm that some P2020’s will remain in service for several years? It was my understanding that all P865 and P2020 ‘s will be out of service by the end of this summer. Thank you! Will it have it’s original paintwork/lineary? That would be cool to see. Lets hope the MTA donates it in good condition as we can see the former San Diego Light Railcar at OERM. Yes! At least one of P865s are going to be saved. Now if you guys can improve service on Blue and Expo lines that will be great before the new regional connector is finished. I don’t really mind seeing an old 1995 Nippon Sharyo P2020s on Pasadena and Azusa once the Blue Line goes to the original Gold Line route on late 2021.